I have sitting on this post since quite a while. About 6 weeks ago, I have had the opportunity to attend an impressive introduction of Chivas Ultis. Maximilian Warner, the global brand ambassador for Chivas presented a multi-sensual experience. There was music involved (with wireless ear phones, the participants had to put on and off), there were different colors of lights involved, scents in form of mister bottles, then there was taste in form of the 5 different malts (ahem 3 - we were told to only smell the last 2) and chocolate truffles. And trust me, when I say, that Pernod-Ricard (owning company of Chivas) did a very good job in the design of the bottle as well as the bespoke POS for the product (glasses, decanters etc.). This is the current highlight; blended whisky producer are very keen on the premiumisation of their products - as malt whisky is growing, and the blended market seems rather stagnant. Truth has to be told: Chivas Ultis is not a "normal" blended Scotch, but it is a blended malt. Just as a reminder: Blended Scotch is made out of Scotch malt whiskies and Scotch grain whiskies... blended malts (formerly known as vatted malts or pure malts) are made solely from Scotch malt whiskies. Blended malts seemed to have died out - a couple of years ago, there was literally only Johnnie Walker green label on the market - and even this whisky was discontinued. There are few other blended malts of boutique producers, who though are rather "pretending" to be single malts (e.g. Lost Distilleries, Shackleton etc. + the con-stunt of Cardhu a couple of years ago) - and there are very unique but not very commercial products (like Compass Box). In fact, there was only one blended malt, which is modern, and has a lot of followers: Monkey Shoulder. I rather don't make the sensual quality responsible of Monkey Shoulder's success, but the highly creative marketing strategy of the William Grant & Sons team (Hendrick's, Sailor Jerry). I have had my doubts, trying the 5 different single malts (which were directly taken from the "Ultis batch"), because I thought, that they weren't really that expressive (and impressive). Tasting the Ultis just cemented my first impression. Don't get me wrong - it isn't a bad whisky - but for its rather premium price tag, it doesn't offer anything unexpected - maybe less of it. This all leads to my initial question: Is blended Scotch (inclusive blended malts) re-emerging? There are a lot of new products and even new companies emerging. But it seems, that the producer are rather putting their money onto a bubble - as well as "mis-reading" the market. I do believe, that consumers are into single malts due to their authenticity and uniqueness. The bubble is created, due to the fact, that marketing exploited this demand. Anyway - to be honest, I have no clue, what Colin Scott (the Master Blender of Chivas) thought, when he released Ultis. It really isn't that great. Other companies are dealing in a different way with the "bubble". 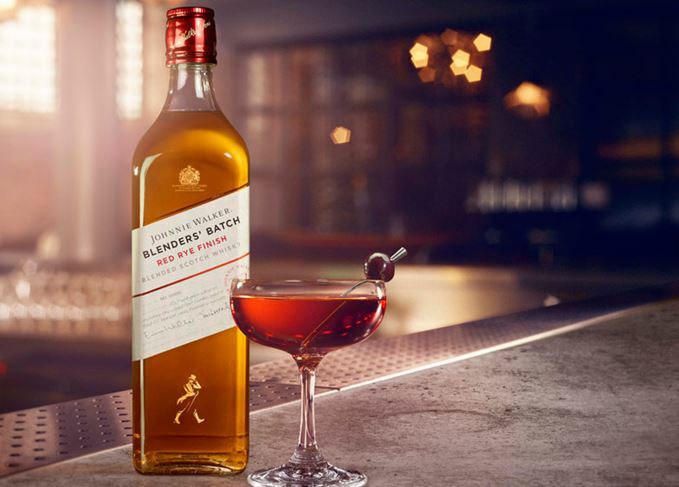 Johnnie Walker (the biggest competitor of Chivas), also freshened up their portfolio. After a couple of years rather mixed, confusing and strange decisions to stuff not existing holes in their premium offering (Gold Label, Platinum Label and so on), JW did something I haven't expected from them... First of all they have reintroduced Green Label. This seems like a "New Coke move", and could pay off. People have just noticed, Green Label, when Johnnie Walker took it from the market. However the new/old expression just has to deliver. A couple of years ago, they also introduced Double Black, which was quite a good idea (but they lacked the effort of Chivas, to make it interesting and accessible for the on-trade). The latest innovation to introduce the "blenders limited edition": Red Label and Black Label, which were finished in Rye Casks. I tried already the Red Label - and unfortunately it isn't as great as it sounds (and looks). It is still a very young and fiery whisky (at times, this can be a good thing - in the case of Red Rye it isn't...). It is noticeable different - but it isn't really enough to make a "splash". I am definitely looking forward to try the Black Label Rye Cask Finish in the future - it seems, that Black Label as starting point is working quite well (e.g. Double Black), and if Johnnie Walker is doing it right... well - to be honest, I am not sure, if they doing it right: rye barrels are very similar to bourbon barrels - they need quite a lot of time to deliver their character. The technique of finishing is more commonly used with (dessert) wine barrels, which are releasing more easily their uniqueness. But yeah - there were some whiskies finished with spirits (especially cognac and rum), but it seems, that they were aged longer in the respected barrel (for Red Label, this seems not to make sense). Hope, that Johnnie Walker is coming up with something better in future (e.g. using rye aged whiskies instead of only finishing the blend) - we will see. So yes - there is definitely some movement in the market - but it seems still not that promising.